The newest family of controllers, from the industry's original manufacturer of micro PLCs, FT1A SmartAXIS controllers deliver affordability without compromise! With superior features and functions built in, design engineers can now enjoy more versatility and more choices for their automation needs than ever before. These simple, powerful controllers deliver an exceptional value, giving you the most bang for your buck! FT1A controllers are available with 12, 24, 40 or 48 I/O, while a 3.8-inch HMI + PLC is also available with sophisticated features and a super-bright LCD screen. Whatever your application requires, the FT1A SmartAXIS family has a solution! The 3.8-inch FT1A SmartAXIS Touch is an all-in-one touchscreen interface and 12 I/O logic controller in a compact body. 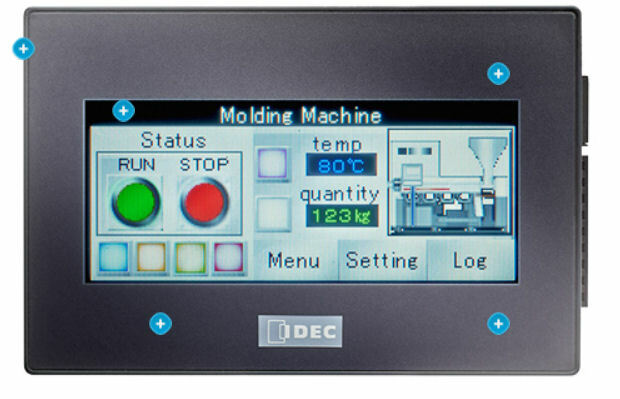 The perfect choice for smaller machines that require a human interface, this HMI+PLC is designed for applications that require limited I/O. Equipped with powerful and abundant features, the FT1A SmartAXIS series is a high-performance solution for limited I/O applications! 12, 24, 40 and 48 I/O models are available in this PLC series. ©2012 Automation Zone. All rights reserved.